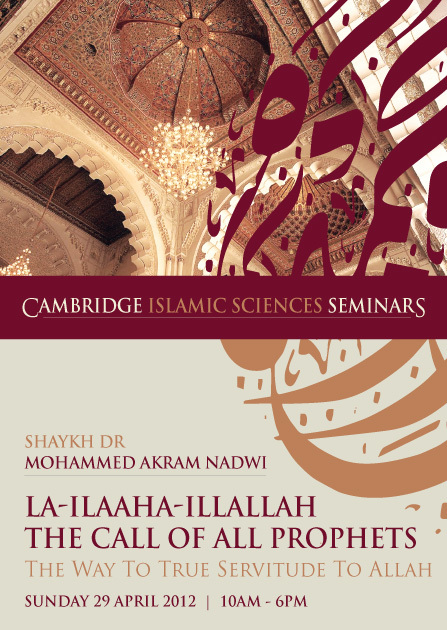 The seminar La-ilaaaha-illallah - The Call of All Prophets - The Way To True Servitude To Allah coming up on Sunday 29th of April 2012 is undoubtedly the most important and the most exciting of the Cambridge Islamic Sciences Seminars so far. It deals with the foundation of our existence and the purpose of our creation in a way that has not been dealt with before. It focuses on how we can become true slaves of our Lord and Master and be a beacon of light and guidance for others despite the prevalence of materialistic ideologies and technological advancements in the 21st century Britain and the rest of the world. As you can see we have made every effort to include everyone and make the seminar affordable. Now it is up to you to make use of this opportunity. Please use the discount codes shown above to register. Of course those who wish to register without any discount can still register at the full price. Every penny spent is spent in the path of Allah. Muslim Education & Outreach Cambridge (MEOC) is a non-profit organisation entirely run by volunteers. So all funds go in to education and outreach (da'wah). Please note that anyone who has paid the full amount already is entitled to receive a refund for the discount. This seminar is suitable for non-Muslims as well. So please bring your non-Muslim and new-Muslim friends and colleagues as guest for free.